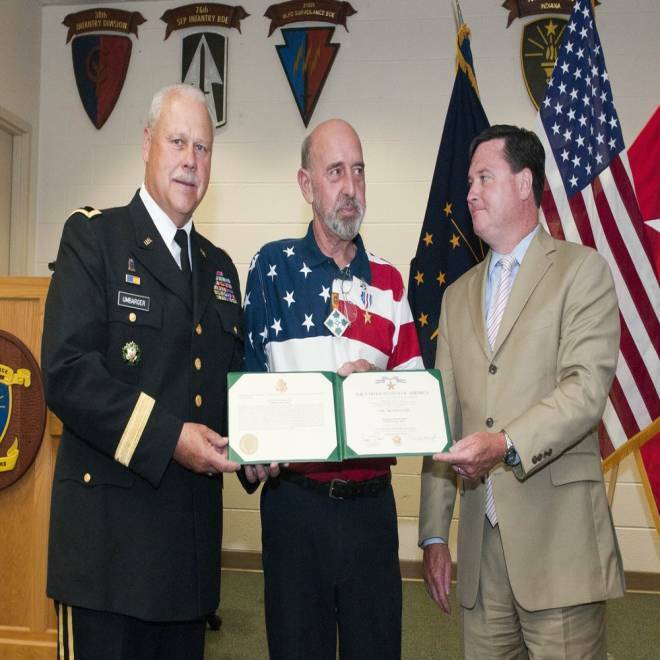 Vietnam veteran Frank Spink (center) receives the Silver Star from Indiana National Guard Adjutant General, Maj. Gen. R. Martin Umbarger (left), and Indiana Congressman Todd Rokita (right), at Indiana Joint Force Headquarters in Indianapolis on Wednesday, Aug. 8, 2012. Forty-four years ago, Frank Spink, a 22-year-old Army sergeant who had been drafted into the Vietnam War, spotted enemy forces approaching in the middle of the night and warned his sleeping platoon leader. Their company was quickly receiving rocket and grenade fire; Spink lost his right arm in the attack and attempted to shoot with his left hand until he passed out. That was in June 1968, and Spink eventually returned home to Indiana following a stay at Walter Reed Army Medical Center, where he received a Purple Heart. "It was a mission," Spink, 66, told NBC News. "I never thought a whole lot more about it." But that night stayed with his platoon leader and second lieutenant John McHenry, who said Spink saved soldiers' lives with his warning. "Those few seconds that we had made all the difference," he said. "If they had gotten much closer with their firepower, we would have been toast." McHenry hadn't really spoken about the attack that night, during which he sustained a concussion, until a few years ago. Then he began wondering if his soldiers had ever received recognition for their heroic acts. "That’s one of the things that haunted me over the years, that the guys didn’t get recognition," McHenry said. He decided to investigate the records at the National Archives in College Park, Md., four years ago and found an order to award Spink a Silver Star that had nearly been lost to history. McHenry believes the mistake may have been the result of an error in the number that identified Spink. McHenry called Spink with the good news. "I couldn’t believe it," said Spink, who didn't realize his actions were worthy of the military's third highest honor. "I thought I was supposed to do that." Earlier this year, Rep. Todd Rokita, R-Ind., who counts Spink as a constituent, lobbied military officials to award the medal quickly. "Sgt. Spink did his duty bravely and heroically, and to our shame as a country, we never gave him the honor he deserved. I'm glad we were able to right this wrong and show our appreciation to him and to all of his fellow veterans," said Rokita. Spink received the medal on Wednesday in Indianapolis at the Indiana National Guard headquarters. In a ceremony attended by many local veterans, Spink asked those who served in Vietnam to stand up and be applauded. "This is their day also," he said. "We were there to watch out for each other."